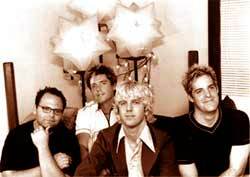 Believable Picnic is a talented, underrated Christian rock band with a few screws loose (no offense guys!). This fun-loving foursome took some time out in the midst of the release of their latest album, Welcome to the Future to do a short follow-up interview with us Hideout folk. This interview took place on: Friday, 8/12/99. Jesus freak Hideout: How would you describe your current sound? Believable Picnic: Noisy, eclectic, pop or just "pop-core." JFH: What bands have influenced your current sound? JFH: Your new album, "Welcome to the Future," shows a matured modern rock sound as well as a more off-the-wall approach at making music. What inspired the vast style differences on this new project? BP: Adding keyboards, realizing who we are as musicians, sleep deprivation, 2 years of music business shenanigans, being flat broke. JFH: Is the band still on Absolute Records? Why had the record's release been delayed so much? BP: Yeah, we are still on Absolute, but this is our last record for them. It's a long story, but we think it will work out best for both parties involved. As far as why it's been so long between albums, there's a lot of story in that too. However, once the album was finally conceived and we decided to do it, the big hold up was distribution. Absolute had been distributed by WCD (Warner Christian Distribution), and our album was set to drop like March 15th, but WCD closed it's doors like 5 days before our album release. So, since then, there has been a mad distribution scramble, and things are just beginning to work out. In any case, we have actually seen fully completed CDs, so in all likelihood it should be in stores in the next two weeks. We are also pretty excited about the new stuff. although it is somewhat of a departure from the "grunginess" of the first album, we think it's rock music that is very cool and, generally, more accessable to everyone - Christians in the rock arena, the CHR market, and to the straight up secular market. We'll just have to wait and see what God has planned for it, and for us. JFH: What is the meaning behind the song "Goodbye Girl"? BP: This song is a rehashing of Solomon's warning to us to not chase after un-Godly women. JFH: "Easy Chair" is a really unique song on the new album. Sporting a 70s sound it boasts playful, yet convicting lyrics. Tell us a little about the song and what it means. BP: This song is a pointed lyric towards those who self-righteously sit in comfort and criticize those who step out in leaps of faith. JFH: What inspired "Little Ditty @ 108bpm"? Also, during the song, a sound bite of what sounds like may be from a movie is heard. What is the clip taken from and who is speaking? BP: Jade's brother Joel's [Hanson, formerly of PfR] frustration with trying to speak what's in his heart but having to state it in such a simple fashion so that everyone can understand and that the answers that God gives us are not always easy or what we want to hear/our disappointment with the industry's formula for that they consider a "Good "CHR Radio Song." The sound clips is from the movie Waiting for Guffman. The town Historian is speaking. JFH: "Hollywood Appeal" is a really interesting song. It not only is different musically for the band, with slowing things down a bit, but it brings up and interesting subject? Tell us about it. BP: A commentary on the world's idea of love versus God's design for True Love. JFH: What is favorite Believable Picnic song? BP: "Sugar" and "Easy Chair" from Welcome to the Future. "Band on the run" -- Wings. JFH: What is your favorite movie? JFH: Do you prefer Mountain Dew or Coke? JFH: Who snores the loudest? JFH: What's your favorite breakfast cereal? BP: Captain Crunch and Lucky Charms. 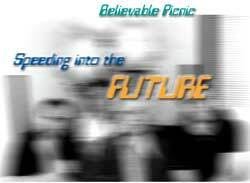 JFH: What does the future hold in store for Believable Picnic? BP: Water ballet, wake boarding, & Nick is going to farm water buffalo. JFH: The Jesus freak Hideout website was started out of appreciation for good Christian music. We've set a goal to try to use the site to spread Christian music, as well as God's Word, & show others how good Christian music really is. Do you listen to Christian music? If so, what bands? BP: We really love to listen to Switchfoot, Steve Taylor, and dc Talk.